The award-winning Appalachian Wind Quintet, based in the foothills of the Appalachian Mountains in Hagerstown, Maryland, is dedicated to presenting woodwind quintet literature from its earliest beginnings in the classical period to the present time. Each of its members has a rich knowledge of musical styles and vast experience with orchestral and chamber music repertoire. Formed in 1987, the group is known for its superb musicianship and innovative programming and has performed a great variety of concerts in the Mid-Atlantic region. Brief oral program notes throughout the concert give an enlightening historical context to each composition. Post-concert receptions to meet the artists and learn more about the featured works add to the warm and relaxed style of the Appalachian Wind Quintet. Frequently, guest pianists perform with the ensemble in order to include some of the great sextet literature masterpieces on their programs. Concert venues for the Appalachian Wind Quintet have included such halls as the Joseph Meyerhoff Symphony Hall, the Baltimore Museum of Art, the Washington County Museum of Fine Arts, and the Maryland Theater. The ensemble has performed for conservatories and institutions of higher learning, such as Peabody Conservatory, Shepherd University, Hood College, Lycoming College, and St. James and Mercersburg Academies. The Appalachian Wind Quintet has been a frequent guest to church music recital series programs. Dedicated to the creation of new works for wind quintet, the group began a successful commissioning initiative and has premiered works by American composers William Bland, Neal Corwell, Wayne Wold, and Mark McCoy. 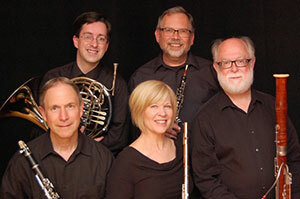 Members of the Appalachian Wind Quintet are flutist Barbara Spicher; oboist Ed Stanley; clarinetist Rick Mogensen, bassoonist Scott Cassada, and French horn player Stephen Pastena. "I have engaged the Appalachian Quintet on numerous occasions for concerts at Hood College, including our annual Summer Chamber Music Festival. Their playing is always of the highest professional caliber and their programs are always eclectic and unfailingly interesting. Their verve and passion for their medium is highly infectious and audiences have responded with great enthusiasm. I highly recommend them!"